Last month, a book called Digital and Marketing Asset Management by Theresa Regli of Real Story Group was published. There have been a few DAM-related publications released or updated this year and I am aware of a couple of others by John Horodyski and Dan McGraw which I still have to read. This is quite different to how things were about five years ago and it wasn’t until first David Diamond and then Elizabeth Keathley wrote their respective titles, DAM Survival Guide and Digital Asset Management: Content Architectures, Project Management, and Creating Order Out of Media Chaos that the situation with books about DAM was anywhere close to being satisfactory. With Theresa’s title now added into the mix, there are finally more choices on offer and some decent coverage of the subject for those with an interest in enterprise and larger-scale DAM initiatives. 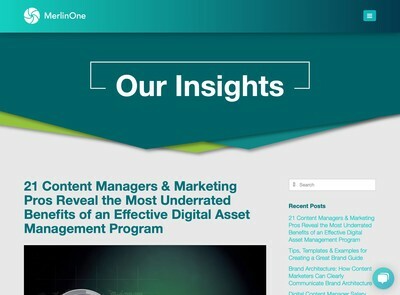 Digital And Marketing Asset Management starts off with some key concepts and history about the origins of the DAM market, included the different sectors where it developed in parallel (stock media, publishing and video). Theresa’s point about this being contributory to why the early DAM market was fragmented would concur with my own experience and goes some way to explaining why the subject still remains quite hard to pin down (in terms of specific functionality) to this day. 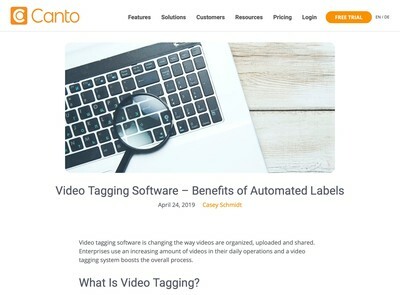 She also describes the conceptual framework for an asset, noting that assets are composed of intrinsic value (which usually corresponds to a digital file) in combination with metadata. Again, these are all aspects which I agree with and there seems to be general consensus amongst most people in DAM now about this model. Theresa goes on to cover the 10 core characteristics of DAM that DAM Foundation have used to define the basis of a DAM solution. There is also coverage of the business case for implementing DAM, in particular the observation that many organisations have been caught out by the exponential growth in digital assets. The general groundwork of the book and its context is solid and I can’t find anything I would take issue with. Given her profile in this DAM sector, this should help to cement these concepts across the rest of the DAM industry also. Theresa goes on to describe the DAM maturity model. I am not as familiar with this, but the basics of it seem reasonable. 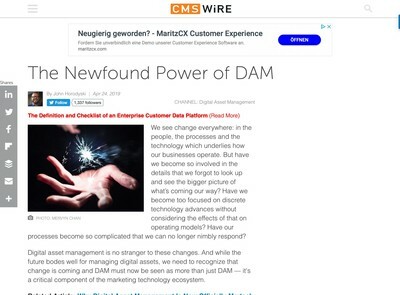 I gather it is partly based on the ECM maturity model and while DAM certainly is different to ECM, there are undoubtedly some common aspects. In the past, my employer had something similar based on people, business and technology (in fact, at one time we even used some catchy marketing phrase using it on websites and business cards etc). I’ve read similar approaches used by both consultants and vendors so the fact that different people have come to the same conclusion suggests that this is a valid approach. The middle section of the book goes into more technical depth about Digital Asset Management. There is a good discussion explaining what ingestion is and in particular, the fact that both the essence (or file) and the metadata must be present at least in basic form before an asset exists. This is something I regularly have to explain over and over, not only to new DAM users, but frequently (and potentially more worryingly) to a number of DAM vendors whose understanding of the solutions they offer is not as well developed as they thought it was. The technical details all seem to be accurate and I couldn’t find too many which were contentious. There were a few conclusions which are correct now, but might be on the cusp of becoming out of date. For example, there is a section about APIs which mentions that many vendors have implemented SOAP-based Web Services and that REST equivalents (which are more modern) tend not to be as prevalent, in fact the language used is ‘borders on non-existent’. I would agree with this in general, but I think it is more nuanced and I can foresee this changing the next 12 months or so. I have been involved in a few technical API troubleshooting assignments in the last few years and the situation with DAM APIs is ‘in flux’ to use a polite description or ‘chaotic’ if you’re less concerned about causing offence. This is alluded to in the book, but given that interoperability is becoming an increasingly important topic, this might get out of date fairly quickly. One consideration which I don’t recall reading (although I may have missed it) is that the longer-term vendors are increasingly having to carry around a lot more legacy technology baggage which is slowing them down and limiting their ability to innovate. The more recent vendors can move faster because they can avoid the overhead of maintaining a lot of old code, however, they are also likely to lack sophistication and depth in certain areas because they haven’t been able to get around to building them yet. In relation to interoperability, I should point out that Theresa mentions that there are currently no standards in DAM relating to this subject. With technical subjects (in DAM or anything IT-oriented) it is possible to rapidly get into some very minute detail and the discussions can end up sounding like two plumbers arguing about which type of pipe to use (and whoever has the leaking sink may care rather less about it). As such, I need to make it clear that the treatment of the technical subjects is very good. I can’t see anyone with a technical DAM systems background having any major issue with the vast majority of her descriptions. I gather from her bio and the article she wrote earlier this week about her time covering DAM that she was a web developer and while she might not have worked on DAM software specifically, based on this book, Theresa certainly could hold her own in any technical discussion of the subject that I have been involved with via a combination of her existing knowledge and what she has acquired during the course of her regular job as a market analyst. The latter parts of the book cover strategic considerations like support, vendor partnerships and placing DAM within the context of other frameworks (e.g. digital marketing). It would be fair to say that Theresa has addressed most of the implementation-oriented subjects that tend to crop up in the course of most DAM implementation projects including how they interface with wider IT and systems considerations. With that said, there are a few elements that are missing. The one which I couldn’t see described much was how this fits into the context of a business analysis or project management methodology. To be clear on the definitions, by ‘business analyst’ I don’t mean industry analysis. I am referring to the IT sense of the term, someone who collects requirements and provides the interface between stakeholders and suppliers (which may include an IT department as well as a vendor). There are descriptions in the book which she states would be of interest for project managers, but based on the type of personnel I tend to deal with, they contain too much technical detail for them and are more like subjects they might ask someone like myself to explain to them in terms of their business/project impact. The priorities they tend to care about are risk and quality management, time and budgets, these are discussed, but more guidance could be needed for a wider project planning exercise. Risk management, in particular with DAM is an important subject because there are exponential effects that scale up with the size of the repository. This generates some complex trade-offs that have to be negotiated: for example if an additional metadata field get specified, it might increase the percentage of assets that are subsequently found in searches, but the extra cataloguing time incurred also leads to an increase in the cost to the business. Quality management in relation DAM initiatives is another large and complex area but it’s not covered in this book nor is there reference to project management methodologies (PRINCE2, PMP, Agile, Watefall etc). These are relevant to more than just the development work (i.e. it isn’t just vendors who have to address them). There is a testimonial on the publisher’s website which states that it is “inarguably the definitive book on DAM. It has all the information; you don’t need to go to multiple sources”. I tend to disagree with that statement. It is a very good book and if you have any kind of involvement with DAM, you need to go out and buy a copy but it isn’t going to be the extent of the materials you should read up on to gain a complete understanding. Single-sourcing expertise is a risky because it’s harder to gain a perspective on what the author is saying. Expecting one author to have covered everything conceivable about DAM (or other enterprise content management technologies) is unreasonable and also would probably yield something that included lots of subjects that many people wouldn’t be interested in. The best books will never be written, as the saying goes. The other aspect of this title which needs some work is the references and additional material. I mentioned this in my review of David Diamond’s latest work: Metadata For Content Management. A point made to me by other people (and David himself) is that unless there is an academic audience, requiring citations and references for everything is onerous and may not add very much of value anyway. I accept that argument, especially for books that will be read by a cross section of readers, however, if references are not included, a reasonably comprehensive list of further reading materials should be provided where people can find out at least some of the inspiration/sources for the points made. The current edition has a few, but there needs to be a few more. There are a lot of independent websites, blogs, groups etc about DAM now (even taking out the vendor-related items) it would be useful to see a number of these mentioned in this book since they contain first-hand experiences of using and implementing DAM. Without the additional material, this can begin to come across a bit like a whitepaper rather than a learning resource (although it would be a very good example of the form, nonetheless). I note that the DAM Foundation directory has a fair collection of these already catalogued and the list is maintained by a number of former MLIS students of John Horodyski, I believe (so they should know what they’re talking about). In addition, I don’t know if Elizabeth Keathley is available for other work these days, but her book has a very good bibliography too. I recommend Theresa engages with a few of these people to help enhance this side of things. Without presuming too much I am fairly sure at least a few of them would be willing to collaborate in some form or another. Setting aside my recommendations for improvements, I have to say, even as it stands, it is an excellent DAM learning resource and if anyone else is planning on writing a DAM-related book, the bar has been set pretty high now by Theresa’s title. 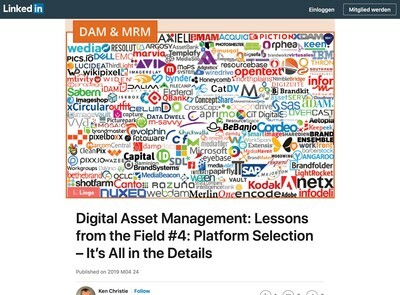 If you haven’t already ordered a copy of Digital And Marketing Asset Management, I wholeheartedly recommend you get along to either the publisher’s website, or your bookseller of choice and purchase a copy today.